The recorded history of Pinole dates back to the early 1700s when a Spanish commandant, Don Pedro Fages, led an exploration through Contra Costa. With a small band of soldiers and an Indian guide, Don Pedro Fages left Monterey and traveled northward until he reached the area known today as Pinole. According to legend, the soldiers ran out of provisions on their march and found a village of Indians who gave them food. This food consisted of a form of meal, made from acorns, seeds, and wild grain, which they called “pinole” (derived from the Aztec word “pinolli” meaning ground and toasted grain or seeds.) Thus, the soldiers named their camp “El Pinole,” and Pinole received its name. In 1823, Don Ignacio Martinez, commandant of the Presidio of San Francisco, received a land grant from the Mexican government. This land grant comprised over 17,000 acres and was known as “El Pinole.” The following year, in 1824, Don Ignacio Martinez built his first adobe hacienda in Pinole Valley about three miles from San Pablo Bay on what is now Pinole Valley Park. With the advance of the Southern Pacific Railroad through the wharf area in 1878, the way became open for the California Powder Works to move into the adjacent waterfront they called Hercules. The company built both the plant and its houses and became the largest producer of dynamite in the world by the turn of the century. During World War l, it manufactured more TNT than any other plant in the country. The city of Pinole became the service center for the plant, and the success of the plant had a direct relationship with the development of Pinole. Twenty of the homes built by the company for worker housing have been rehabilitated and relocated to an historic district receiving area adjacent to the Pinole city limits. Edward M. Downer came to Pinole in late 1889 and went to work in 1890 as a dispatcher and station agent at the Southern Pacific train depot at the end of Tennent Avenue near the waterfront. During the last ten years of the Nineteenth Century and the early part of the Twentieth, he was one of the most influential and prominent business figures in Pinole and the surrounding areas including Rodeo, Crockett, Port Costa, Richmond, El Cerrito and Albany. This was due to the chain of banking houses that he and his family established in these cities, and to his civic efforts and successes all through these areas. The history and architectural character of Pinole was very much influenced by the commercial activity that took place here, including the Gold Rush, agricultural shipping (about 1854 to 1885), railroad shipping, California Powder Works Company (1879 to the 1970s), the growth in automobile travel, World War II — 1940s, and construction of I-8O. The Old Town area of Pinole is unique. Despite rapid growth since the 1950s, Pinole's downtown has retained a great deal of historic and architectural character. A large number of historic residences, primarily Queen Anne and Italianate cottages, remain in good condition, and many of the old commercial buildings still remain. The first Bank of Pinole was organized in 1905 by E.M. Downer Sr. and located in the George Fraser building on San Pablo Avenue between Tennent and Fernandez avenues. A new limestone neoclassical structure was built across the street in 1915, and remained in use as a bank until the 1960s, when it was sold to the Pinole-Hecules Youth Memorial, incorporated by Mechanics Bank. In 1975, the building was purchased by the city of Pinole for $1, with the stipulation that it continue to be used as a youth facility. The building was again sold, in 1992, to the Pinole Redevelopment Agency after it was deemed structurally unsafe due to damage from the 1989 Loma Prieta earthquake. The $250,000 received by the city for the transaction was set aside in a fund earmarked specifically for youth purposes. In 1995, the Redevelopment Agency funded the retrofit and renovation of the old bank building, which reopened for commercial use in 1996. It's occupied by the Flower Cart. A large number of historic residences, all of which were built for individuals who worked in Pinole or at the Hercules Powder Works, remain in good condition throughout the Old Town area of Pinole. Due to the stability of the powder plant until the 1970s, Pinole's residential neighborhoods were not exposed to major changes created by land development or speculation. These homes, which can be categorized as Queen Anne Cottages (1880-1905), Hip Roof Cottages (1870-1910), and Bungalows (1915-1930), are simple in character and gain their importance by their neighborhood groupings. 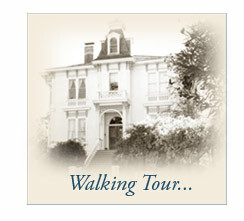 You can view these residences, and learn more about Pinole’s history, by taking a Walking Tour. Visit the City of Pinole’s website for news about the East Bay’s sweetest community.